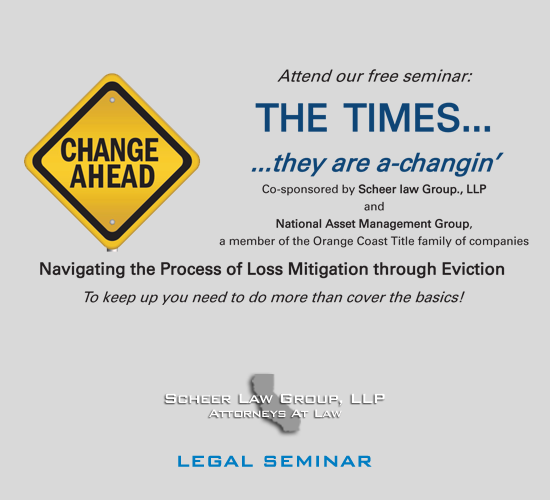 Presentation By: Spencer Scheer, from the Scheer Law Group, LLP. Don't miss this important event!! Co-sponsored by National Asset Management Group (a member of the Orange Coast Title family of companies), this informational seminar will help you to stay up on latest trends and developments that are key to your continued financial success. Don’t miss this important event!! Co-sponsored by National Asset Management Group (a member of the Orange Coast Title family of companies), this informational seminar will help you to stay up on latest trends and developments that are key to your continued financial success.